Old School New Body is a fitness program crafted by Steve and Becky Holman. It's mainly marketed as having anti-aging benefits, and as a low-impact way to build muscle and burn fat. Most adults start to get the “skinny-fat”, “dad-bod” look as they get older. According to Steve Holman this can be fixed with his workout and eating principles. This review will give you a better idea of what Old School New Body, the F4X Training System, and the OSNB Ageless Nutrition Plan are all about. We will summarize the program and highlight the pros and cons. Also, this review will try to shed light on some of the claims Steve Holman makes about exercise and aging. It can sometimes be difficult to tell whether such claims are exaggerated (or false) in order to sell the product. So we will investigate. Most of the information about Steve and Becky Holman comes from their website. They are both in their early 50's. Steve is a lifelong athlete and former editor of Iron Man magazine (where Becky is a contributor). Apparently he has written over 20 books about fitness (I believe this is his Amazon author page). The authors begin with a little history lesson. They came up in the 70's and 80's, when training with super heavy weights (and taking steroids) was all the rage. Vince Gironda was a legendary “trainder for the stars” in California. He swore by high-repetition, moderate-weight workouts. Steve Holman was skeptical like most people. But he noticed that Gironda had aged remarkably well, and seemed to avoid the injuries that plague most older bodybuilders. Vince Gironda passed away in the late 90’s and his wife asked to store some of his old work at the Iron Man office. Steve Holman was editor-in-chief at the time. He began reading through Gironda’s work and realized it was consistent with current research on high-repetition exercise. That’s how Steve Holman ended up embracing Gironda’s work. He and his wife Becky Holman followed Vince Gironda’s high-rep, moderate weight training philosophy to great success (in their telling). And they adapted Gironda’s ideas into their own “F4X” Training system. What Is The “F4X Training System”? The F4X program is about trying to naturally boost your growth hormone and testosterone (important for women as well as men) through exercising a certain way. There are actually several different variations of F4X, depending on your goals. But all the variations are based around the same core idea. No matter which F4X variation you follow, you’ll be lifting at least 3 times a week. Your workouts will consist of usually at least 5 exercises. You’ll do a prescribed number of high volume sets and reps for each exercise. Rest between exercises is supposed to be minimal. This is a lifting plan to follow if you’re a beginner. It’s challenging but manageable. You’ll be lifting 3 days a week and the sessions will usually be less than 30 minutes. But you’ll still be hitting the major muscle groups. Some of the lifts use dumbbells. They do give some bodyweight alternatives, and they say you can use makeshift dumbbells, but they recommend eventually switching to dumbbells. This one is similar to the “lean” workout. But the difference is you don’t train all your muscle groups each workout. You still lift at least 3 times a week, but you’ll hit specific groups more intensely each workout. There’s also a wider variety of exercises in the “Shape” workout. Some can be done with barbells, and some use machine lifts. By the way, they give instructions and illustrations for the different exercises. These are also really common exercises, so you can easily find videos on YouTube for any of them. As the name suggests… all dumbbells. Other than that, it’s similar to the two others. You target certain muscle groups with each workout instead of full body. The workouts are different, but the number of reps and rest is similar. The last workout program is the advanced “build” program. It’s definitely advanced, and I would only recommend it to experienced gym rats. Same reps-and-rest concept as the others, but the sheer number of exercises (ten) is daunting, especially with little rest. This plan requires dumbbells, incline benches and gym machines. You’ll be lifting to failure in many cases. They also throw in some variations with tempo and rep cadence. Each workout takes about an hour. Old School New Body recommends cardio on off days but doesn’t require it. A low or moderate intensity cardio exercise is ideal. They recommend biking because it helps strengthen the knees. But what about interval training? Isn’t that better? The authors agree that interval training is powerful for burning fat. But they say you get the same benefit with F4X workouts, only better because you target the entire body instead of just the lower body. So they recommend sticking with low intensity cardio for about 45 minutes on your off days, if you so choose. They do a pretty thorough job explaining diet principles. There isn’t a day-by-day plan you have to follow, but there are guidelines and example diets. In essence it is a high-protein diet that includes plenty of dairy, meat, fruits/vegetables and some protein powder. They don’t allow for high glycemic foods but do encourage eating slow burning carbs (usually in vegetable form). They also stress the importance of eating regularly. Going long periods without eating causes your body to go into starvation mode and give you that “skinny-fat” look. If you’re vegetarian or vegan, you’ll probably have to follow a different diet plan. There is also a recommended supplement: Branched-chain amino acids. BCAA’s have become popular among athletes and Old School New Body recommends taking them in capsule form. They cite some research about BCAA’s helping to enhance muscle growth and reduce muscle stress. This is a natural supplement- it’s just a few specific types of amino acids in concentrated form. There is one amino acid in particular – leucine – that’s been shown to have muscle and testosterone boosting benefits. This is another supplement they recommend. It’s meant to reduce cortisol levels. Cortisol is known as the stress, fight-or-flight hormone and elevated levels can impair muscle growth and recovery. They again cite a research study showing that phosphatidylserine decreases cortisol output. And they recommend taking it before workouts. It may well decrease cortisol output. But they didn’t have any research to support the claim that doing so really does help muscle growth (unlike BCAA’s, which have a lot of supporting research). You can decide for yourself if adding this supplement is worth it, in the absence of supporting research. The authors make note of caffeine’s proven fat-burning ability. Same with L-carnitine, which is an amino acid. L-carnitine helps put lipids (fat cells) through a process called beta oxidation, in which fat gets burned and converted to fuel. They recommend caffeine and L-carnitine daily to help burn fat. There is a lengthy section about dealing with joint pain. The authors talk about the most common injury areas. You can probably guess what they are: knees, elbows, shoulder, back. Fortunately, most lifters end up getting the same types of overuse injuries, so people have figured out which exercises are most helpful in fixing them. These exercises strengthen common muscle imbalances in these joints to prevent chronic injury. 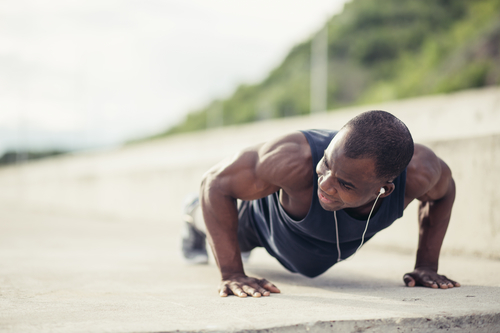 All in all, this is a solid guide to sustainable fitness. The principles behind F4X are supported by research, only some of which is cited in the program. Moderate intensity workouts have a long history of getting people good results. If your goal is to be lean and muscular, this type of program is more than enough. If your goal is to look like a genetic freak, you might look elsewhere. But for the other 98% of us, it’s probably worth a try. Beginners will be able to start gradually with the “lean” program, doing fewer sets until they get stronger. If you’re more advanced you can jump in to one of the programs and build from there. Even though the authors are in their 50’s, the program is appropriate for younger and older age groups. Visit the Old School New Body website here and decide if you’re ready to give it a try.